Chewy's Story: A first-hand account with the healing power of bovine colostrum. by Dr. Steven Blake, Jr., DVM. Flower Essences are potent non-aromatic vibrational liquids that are taken internally to create profound healing and change. They get quickly to the heart of the issue, creating balance, well being, and health. This book by a Naturopathic Holistic Veterinarian is filled with true stories about animals he has treated over the past 30 years. It includes a resource section to help you find alternative veterinary care and natural products. I have found the Young Living Essential Oils and products to be the finest I have ever used in treating myself and my animals to promote and restore body energy balance and wholeness. We use them at our sanctuary on a routine basis, even when all is well. Please Note: Alternative healing methods are not meant to take the place of expert veterinary care. When your pet is ill, consult a holistic veterinarian. If you were to walk or drive by our house, I can almost guarantee that you would laugh. On our front porch, on each side of the door, we have two large ceramic shih-tzu dogs. The center of our front door is a glass strip about one foot wide, extending vertically from top to bottom. All day long, our little four-year-old, black and white shih-tzu sits there peering out, waiting for the mailman, who never fails to deliver a dog bone along with the mail. It looks so silly. His name is Chewy. Actually his name is Chewbakaafter the character from Star Wars. Everyone who meets Chewy falls in love with him. Six months ago, my husband and I went through a nightmare when we almost lost him. One day, he suddenly became ill. For over a week, he sat in the same spot just staring at the wall. We could not get him to respond. He refused to eat or drink. Our first thoughts were that hed been poisoned, but the blood test taken by the vet came back negative. The next day, we noticed blood in Chewys stool. We were frantic for an answer and very upset when the vet told us it had to be psychological. That very day, Chewy had a new vet. This doctor immediately noticed paralysis in his back legs. Suspecting ruptured spinal discs, he took x-rays which confirmed this diagnosis. Chewy had three ruptured discs in his spine which also caused internal hemorrhaging. Shih-tzus are known to have weak backs. We dont know how Chewys back injury happened but we think it might have been while he was playing with our friends huge puppy. The vet told us we had to keep him absolutely immobile in a cage if he was to have any chance of healing. He hydrated him intravenously and sent us home with a lot of different medications. Every day, Chewy was back at the vets because he was rapidly going downhill. The steroids he was taking gave him his appetite back but within five minutes he would lose everything he had eaten, along with a lot of blood. The vet told us we had the choice of a $4,000 surgery (Chewys chances would be 50/50) or we could put him to sleep. That night I sat up all night holding him in our laundry room. He was projecting blood from both ends and he and I were covered all over with blood. So was the entire room and everything in it. I was beyond hysteria. All of a sudden, the thought came to me that I just had to get Chewy off all of the medicine and give him some colostrum. Why hadn't I thought about colostrum before now?! Hour after hour, I inched it into his mouth with a little spoon along with some water. The diarrhea and vomiting stopped immediately. The next day I put his little stuffed animal next to him and he licked it. That was the first sign of life that wed seen from him in weeks. Today, Chewy is our super dogfull of energy and curiosityhe leaps up on the couch in a single jump and bounds up the stairs two at a time. We took him back to the vet after his recovery and he told us that he must have mis-diagnosed his conditionuntil we had him pull out Chewys X-rays! Without the evidence in front of him, he simply would not believe that this was the same dog that had the spinal injury. Read a scientific article about the benefits of bovine colostrum. For additional information or to order New Life Colostrum products, e-mail Gina Palmer or call her at 760-533-0778. Flower Essences are potent non-aromatic vibrational liquids that are taken internally to create profound healing and change. They get quickly to the heart of the issue creating balance, well being and health. All Anaflora Flower Essences are made by Sharon Callahan specifically for animals from flowers growing on and around Mt. Shasta in Northern California. Animals today, even those cared for deeply in the best of homes, are greatly challenged as they attempt to attune themselves to new and accelerated patterns of growth and behavior in humans. The resulting emotional and mental stress on the animal is often alleviated by the properly prescribed Flower Essence Therapy. Both wild animals and companion animals respond remarkably well to Flower Essence Therapy. Flower essences may be used to achieve deeper states of bonding and communication with an animal, as well as for the more traditional difficulties such as shock, fear, depression, relocation anxiety, trauma, abuse, and others. It is common that Gina will administer a flower essence/essences during a consultation with an animal, which brings about almost immediate results. Then, after the session is completed the person will continue introducing the essence to the animal (and themselves) as part of the continued healing or behavior therapy. Flower essences are helpful to animals traveling, senior animals, lonely, stressed, grieving, transitioning, health or behavior challenged, new to the family and many other conditions. Call me to chat about your animals situation. For descriptive information on individual Anaflora Essences, click here. You may order Anaflora Essences from Gina by telephone or by filling out and mailing the order form. For additional information e-mail Gina or call 760-533-0778. Naturopathic Holistic Veterinarian, Dr. Steven Reeve Blake, Jr. has written The Pet Whisperer, which is a book about his friends the animals and their caregivers. The book is filled with true stories about cats to elephants, which he has treated over the past 30 years. You will laugh and you will cry but in the end you will come away with a feeling of HOPE. The stories reflect the feelings of the animals, their caregivers and Dr Blake. He has also included a resource section to help animal lovers find alternative veterinary care and natural products for keeping their pets healthy. Now Available! 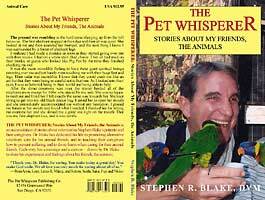 To order Dr. Blake's book, you can go to his website www.thepetwhisperer.com and order directly on line. They are priced at $12.95 each plus shipping and handling. Young Living Essential Oils were first introduced to me by Naturopathic Holistic Veterinarian, Dr. Steven Reeve Blake, Jr.
Dr. Blakes professional expertise was needed to help treat my twelve-year-old Siamese feline, She-Ra-Lee-Oh-Ma-Ra. Shera had been diagnosed by allopathic vets as having Cryptococcosus, a deadly fungal disease which attacks the nervous and respiratory systems and is known to be fatal in 98% of the cases. Dr. Blake treated Shera with a variety of naturopathic remedies, organic whole foods of raw meat and vegetables, Symbiotics colostrum, homeopathic formulations, and Young Living Essential Oils of frankincense, Purification, and Valor (specific formulations created by the Young Living Company). As an animal communicator, I have learned from the animals that assisting them in restoring body wholeness requires cooperation and dialogue with the one being treated and should never be forced. I was concerned that aromatherapy might be too intensely potent for an animal, given its keen sense of smell. Shera (and Dr. Blake) suggested not putting the aromatherapy directly onto the animal but rather diffuse the aroma into the animals environment. I purchased a diffuser kit from Young Living that administers the aroma, in the form of a fine, moist mist, into the environment the animal prefers to rest in. This method of application was very well received by Shera, and she continues her recovery. It has been four months since her original cryptococcosus diagnosis, and Shera remians vital, continuing to improve dramatically. I owe a portion of her remarkable recovery to the Young Living quality of aroma therapy. Aroma therapy is mentioned in numerous passages in our modern day Bible, and is known to have been used by the Mayans, Egyptians, Greeks, and other indigenous cultures of the world for a variety of health conditions. Gary Young, creator of the Young Living product line, has consulted with some of the most esteemed M.D.s and Ph.D.s in the world, as well as with the Hunza people of northern Pakistan. In 1998, he visited the Hunza valley in the Himalayas to explore the longevity secrets of the Hunza people, who commonly live 110 to 115 years. Gary Young discovered that the Hunza diet is based on unprocessed foods and minimal meat, emphasizing many fruits, vegetables, whole grains such as buckwheat and millet, mulberry, figs, almonds, walnuts, apricots, etc. The focus on whole foods ensures the Hunza diet is high in vitamins, minerals, and dietary fiber. Gary Young has combined the foods common in the Hunza diet with the Chinese Wolfberry from Inner Mongolia and other ingredients to create the all-new Essential Manna, a complete food high in fiber and other nutrients. Essential Manna consists entirely of whole, unrefined foods, a full amino acid profile, and is high in potassium and magnesium, minerals necessary for many body processes, including blood pressure regulation, protein systhesis, and glucose metabolism, often lacking in the Western diet. In the country of Oman, where frankincense trees grow, Gary Young learned that in ancient times frankincense powder was known as manna. Young Living Essential Manna combines those ancient traditions with modern health philosophies. Ingredients are: organic apricots, apricot oil, wolfberries, barley, buckwheat, amaranth, figs, almonds, millet, brown rice, banana, coconut, dates, oats, pineapple, walnuts, filberts, papaya, pumpkin seeds, cashews, pecans, natural vitamin E, grapeseed oil, and frankincense powder. I have found the Young Living Essential Oils and products to be the finest I have ever used, in treating myself and my animals, to promote and restore body energy balance and wholeness. We use them at our sanctuary on a routine basis, even when all is well. I highly recommend that you try them for yourself and diffuse them into your animals environment. No other aromatherapy can compare with Young Living! Special Note: Often, when your animal asks to partake of your dinner plate by jumping on your table, counter, etc., he or she might be suggesting that the food you are feeding him/her is simply inadequate, lacking in the nutrition, vitamins, and minerals they need. Animals truly are not being rude; they are simply being very direct. Consider supplementing their diet after consulting with a trained animal nutrition expert and reviewing books such as Dr. Pitcairns Complete Guide to Natural Health for Dogs and Cats, Rodale Press, ISBN 0-87596-243-2 paperback, or Natural Healing for Dogs & Cats by Diane Stein. Gina Palmer can mail you information about Young Living Essential Oils on request. E-mail Gina now, or write to Paws & Claws, PO Box 2525, Vista, CA 92085-2525. Specify Ginas member I.D. number 220296.